How confident are you when you place a piece of meat, fish, or poultry into a skillet? Does that steak sometimes sick? Do the scallops fail to brown? Here is a video with some browning (searing) tips and tricks. Here are some questions I frequently get in class about browning in a skillet. What type of skillet do you use? My go to skillet for searing is a good stainless steel one. It browns beautifully and leave you brown bits to make a pan sauce. The only exception to this is searing fin fish. Only the firmest fish (tuna, swordfish, shark, and marlin) can be seared in a stainless steel skillet. Other fish will stick. In that case, use a well seasoned cast iron skillet or a teflon one. Scallops, shrimp and seafood will be fine in a stainless steel skillet. Here is my post on pots and pans that includes my favorite brands and sizes. How do you wash a stainless steel skillet? It always takes me forever to scrub everything off. Boil water in the skillet for 5 minutes. Pour out the water and wash while the skillet is still pretty hot. If all else fails, try Bar Keeper's Friend. Works like a charm for stainless cookware. Here is a video on how to wash a stainless skillet. I use canola because the smoke temperature is a little higher than olive oil. You can use whatever you like (grapeseed, olive, peanut). If you want to produce faster browning on lean proteins, try using 3 parts oil to 1 part butter combo. The milk solids in the butter will brown quickly giving you beautiful color and flavor on things like scallops and halibut. What proportion of salt to pepper do you use? I use about 5 parts salt to 1 part pepper, but you can do whatever you like. Just keep in mind that you want way more salt than pepper. Can you achieve good browning on electric stove? Yes, you can achieve good browning on any stove. What's much more important is the quality of your skillet. Just make sure to preheat your skillet long enough so that the meat sizzles at first contact. If you are working on electric stove and need to lower the heat, you might need to move the skillet off the burner temporarily to avoid burning. What was that about not washing chicken and any other proteins? Isn't it dangerous? No. It's actually safer. Even USDA recommends you don't wash proteins. What stunning dish should you make this holiday season to practice this technique? 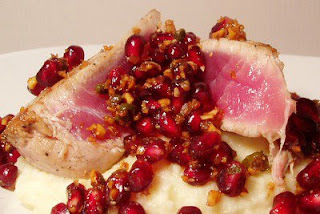 If meat is not your thing, the seared tuna with pomegranate topping is a fun and festive dish. I really appreciate this video since I cannot fry anything at all. I never even tried meat because I was sure to ruin it and it's not cheap. While we are on the subject, I still cannot figure out latkes. I used canola oil, which did help but not much. The latkes are still raw on the inside. I can squish them so they are lace thin but I like some texture to my latkes. Did you want to do a latkes frying video as a side project since it's Hanukkah and all? I am going to try the rugelach recipe. Very excited about it. It does not require frying. Unfortunately, no time to make a latkes video right now. Maybe next year. Here are some tips. If they are not cooked through, lower the heat and cook them longer. Also, how are you grating your potatoes? The holes on the grating disk in most food processors produces very large pieces. If that's what you've got, you need to then pulse them in the processor fitted with the blade until the mixture is very fine. The bigger your potatoe pieces, the longer they'll take to cook. Thank you very much for your replies. I really appreciate them. I use the old fashioned grater. I probably use the 'medium' section which is still smaller then the food processor. I can try the smallest side but I feel the grated pieces come out more attractive on the medium. I tried Yukon potatoes and then the russet potatoes that everyone recommends. I think I prefer Yukon (but I have no idea why no one uses them)It's like every recipe I read hold a mystery. I will try lowering the heat. I have faith I will get it one day but maybe not this Hannukah. Any thoughts on maybe using the oven to 'finish them off' I mean this in the nicest way possible:-) I don't see any recipes for finishing in oven from anyone so I am assuming it's a bad idea, but thought I'd ask. Oh, sorry, I thought you were using my latkes recipe and having trouble. but since you are mentioning baking and yukon potatoes, I guess you haven't found mine :) I use red bliss and the large holes on a box grater are still too large (yes, they are smaller than food processor, but still too big). The potato mixture should be almost pureed. Follow the above recipe and let me know if you are still having trouble. Larger pieces of potatoes might look nicer, but they need a completely different approach to make them work. You need to par-cook potatoes, or skip flour and egg and make them lacy thin. Neither approach will give you traditional Jewish latkes. Thank you for this post. While I am not a novice in cooking, I've avoided the use of the stainless steel pans. Your video helped me immensely. I already cooked the steak and even got hold of the "changing the intensity of the heat" technique. Fennel and celery cutting videos were very helpful, too. Thank you. Congrats on your steak. So glad you found this post useful. Most people define a bad cook as someone who burns everything. I think that is silly and just encourages people to serve pale and boring food. Best of luck in all your cooking adventures.